Bothered by your yellow or discolored teeth? Ask us about professional teeth whitening in Rancho Cucamonga! Our options for whitening lighten the enamel and dentin of your teeth to produce a bright new smile. 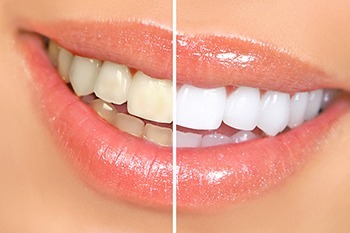 In-House Teeth Whitening – whitens up to 8 shades lighter in only one hour! Our advanced in-office tooth whitening procedure uses a bleaching agent, or hydrogen peroxide, that allows oxygen to fully enter the tooth’s enamel and dentin. However, the structure of the tooth remains unchanged. Even the most sensitive patients can benefit from our whitening, as we use top of the line bleaching products tailored to each patient’s sensitivity level. We also offer custom trays and touch-up cartridges to maintain your whiter smile at home. Take Home Teeth Whitening – customized bleaching splints for convenient use at home. Our cosmetic specialist will take an impression of your mouth to create a custom bleach splint to fit your smile. These splints look like a regular mouthguard and are used to hold the bleach against your teeth. Is Teeth Whitening in Rancho Cucamonga Right for You? Not every patient is a good candidate for professional teeth whitening. For example, existing dental work like crowns or veneers will not respond to any whitening process. Patients may also want to avoid consuming staining beverages like coffee or red wine. In addition, smoking or the continued use of tobacco products will also stain your newly whitened teeth. Busy Schedule? New Patients Who Book Saturday Consultation Appointments Receive a FREE At-Home Tooth Whitening Kit! As one of the premier dental and orthodontic practice in Rancho Cucamonga, CA, our team at California Dental Care & Orthodontics also provides 5-star-rated options for professional teeth whitening to patients from Rancho Cucamonga, Alta Loma, Claremont, Fontana & Rialto, CA.